From Memebox: Has your booked-solid work and study schedule kept you from flying to your dream tropical beach getaway? Get a whiff of our fruity tropical beauty picks and visualize your way to white sands, swaying palm trees, and the refreshing tropical sea-breeze! Take a pick from fresh and light tropical fruit scented beauty goodies that are great for causal days under the sun, or from sweet, sensual and alluring fruity beauty treats that are perfect for a summer romance or a glamorous night out! Dive into this tropical fruit scented box for a fragrant and exotic escape! This is a bar soap that deep cleans, treats enlarged pores, and improves skin elasticity and firmness. 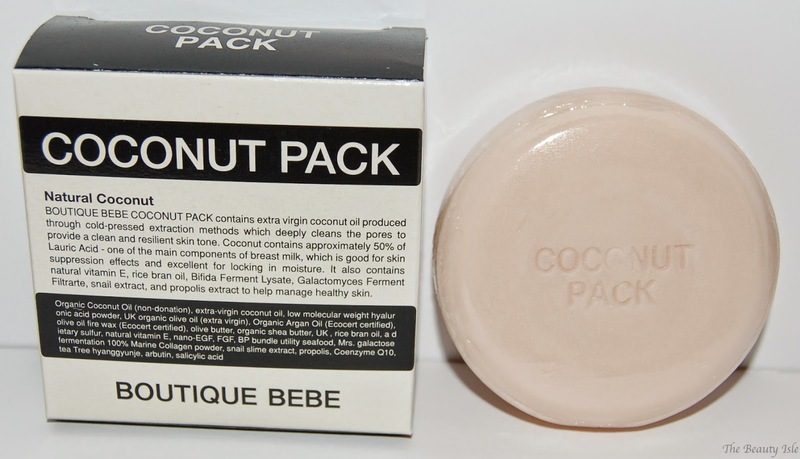 This has a really strong coconut scent which I love but I really don't like bar soaps so I will pass this along to someone else. This is a foaming face cleanser. It gently cleans and since it contains antioxidants and vitamin C, it also strengthens, brightens, firms, and soothes the skin. This has a really soft fruity scent. This hand cream contains argan oil, shea butter, olive oil, and vitamin E so it's super softening and feels great. It has a fruity mango scent. I received the color/scent Kiwi which is green. I love the Kiwi scent this polish has once it is dried (in the bottle it smells like regular polish). I'm not a fan of this shade of green for nail polish so I'll probably pass this along to someone else. I received the strawberry scent of this shower gel. This includes naturally derived fruit extracts which soothes and rejuvenates the skin. Again, the scent is fruity. I'm curious to try everything in this box except the bar soap and the green nail polish. Everything smells so pretty and I'm sure I will enjoy using each one. Please note that the information on the products is not in English so each box includes an informational card which you should not throw away! This box was $15 and $6.99 for shipping. As you can see, I received 5 full size products and the retail price of these products add up to $54 which is more than twice what the box + shipping cost! This particular box is sold out but there are tons of boxes that are ready to be shipped right now. There are a few I've had my eye on including the Samantha Schuerman box which is mostly makeup! Memeboxes are shipped directly from Korea which is really cool. Also, this is not a continuous subscription service, you pick and chose which boxes you'd like to receive and there are numerous ones each month to pick from. If you'd like to check out the selection you can click HERE and until the end of November Memebox is giving my readers $5 off any order that is $30 or more with the code TQJQZ1!